Looking for another reason to visit “Best Suburban Burger” nominee, “Wiener and Still Champion”? As if my word wasn’t enough, Food Network was there all this week filming for an episode of “Diners, Drive-ins, and Dives”. They spent the week filming everything from food prep to customers enjoying their food. While I missed the interviewing of the customers, I was on hand to catch the taping of Guy Fieri (host) and Gus (owner) doing their best Penn and Teller act. Gus is great but a little on the quiet side, while Guy is far from quiet and constantly joking. They chomped on burgers, corn dogs, chili fries, and even some country fried bacon. If Guy’s cholesteral wasn’t a problem before this week, it is now! After the taping was done, Guy was gracious enough to take pictures and sign autographs with everybody. My wife and I of course had to have a pic taken before he jumped in a limo and drive away (the Camaro is just for show). 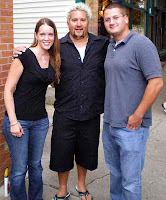 The episode will be part of season 5 of “Diners, Drive-ins, and Dives”, and will probably air around January 2009. This means you have about 6 months before this place really gets busy! All in all, I had a great time checking out one of my favorite places getting it’s due. Sure I wish I could have made it on camera, but I’m proud of Gus and all the folks at “Wiener and Still Champion”. Remember, you can catch all my reviews (good and bad) by clicking my name in the blog roll, or by clicking here. Over the next few weeks I will be spotlighting some of the best burger joints in the ‘burbs, counting down from #3 to #1. We’re not talking fancy shmancy steakhouse burgers, but rather good old “street food” burgers. Let’s start with #3 on the list. The definition of a champion is: One that is clearly superior or has the attributes of a winner. When it comes to huge burgers, “Wiener and Still Champion” is making a serious title bid. 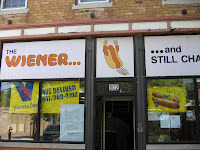 Located just one block west of Chicago Ave, on Dempster in Evanston, “Wiener and Still Champion” is a little hole in the wall most people don’t even know exists. The small storefront restaurant is easy to miss amongst all the tall trees that block their quirky sign. Step inside and you might wonder if you made the right decision to eat there. The place isn’t pretty by any means, but walking out would be a mistake. Don’t be bothered by the fact that there’s only six tables, neither TV gets reception, or that they have to pry the register open with a butter knife, we’ve all been to places that look the part, but can’t deliver. If you’re a fan of burgers, then this place certainly delivers. The small menu covers the bare minimum of hot dog stand choices. Burgers, dogs, chicken sandwiches, fries, and fried pickles pretty much round out the menu, no gyros and no Italian beef. 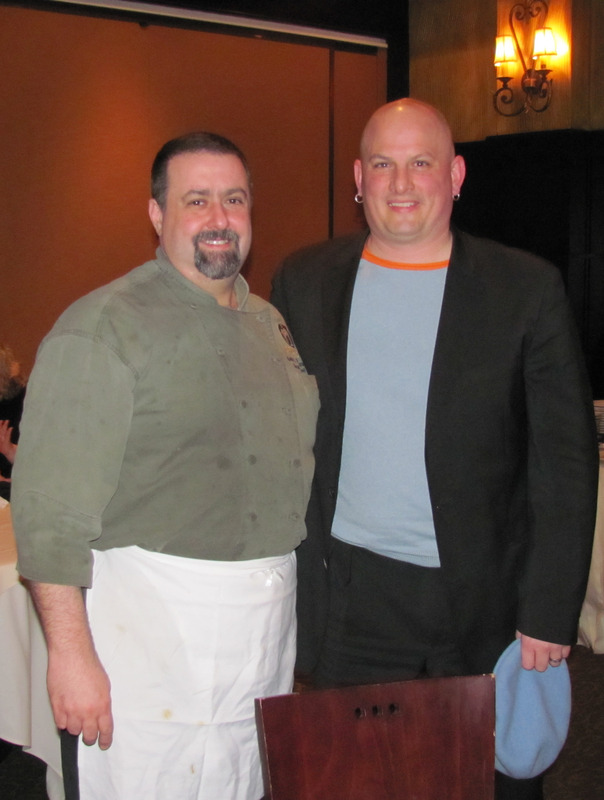 Again, it’s not the size of the menu, but rather how well you execute what you do serve. A few visits to “Wiener” have allowed me to sample pretty much the whole menu. We’ll start off with the hotdog, which was served hot, on a poppy seed bun, and dressed with all the proper toppings. If you want a different twist, then their dipping dog is worth a try. Many places serve a generic version of a corn dog that isn’t even Vienna beef inside, not so here. The owner, Gus takes pride in preparing nearly everything in house, and that includes dipping Vienna beef hot dogs in a corn bread coating, and deep frying them to a dark shade of brown. 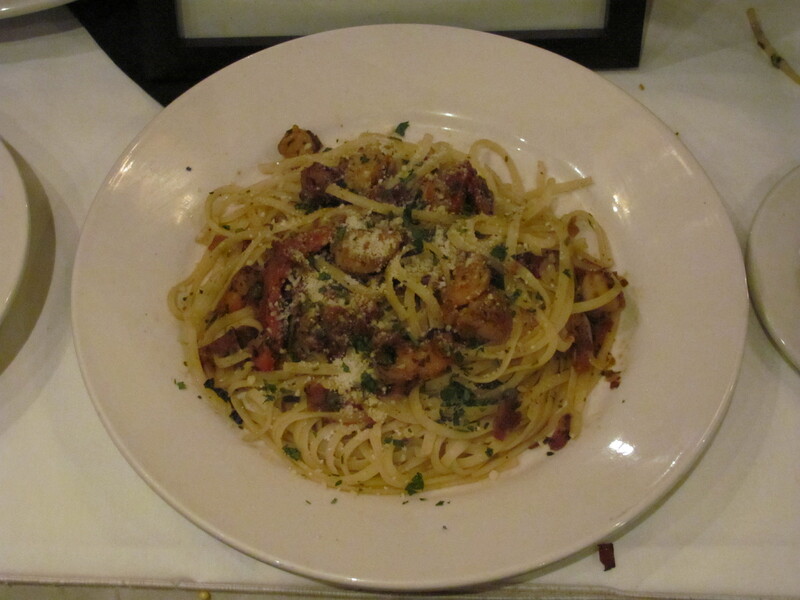 Want something light to eat? You’re at the wrong place, but they do have a char chicken sandwich if need be. The chicken has a nice char flavor, but is very thin and almost seems out of place on this menu. Before I get to the burgers, let’s talk sides. Arterie clogging is happily on display with items such as breaded and deep fried bacon, fried pickles, and some outstanding French fries. 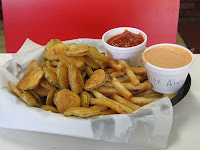 The pickles are a nice alternative to the usual fries and onion rings. The crisp batter and the slight vinegar taste at the end make these pickles a nice surprise. But the star of the side items is clearly the fries. Fresh cut and deep fried to a perfect crispness, these are some of the best fries you’ll come across. But let’s talk about the real reason to come here, the burgers. Sizes range from L, XL, XXL, XXXL, and XXXXXXXXL! Patties start at a 1/3 lb, but how many patties you want is up to you. Sure you can get a single, but why? This place invites people with large appetites and a love for juicy burgers, to put their stomachs to the test. 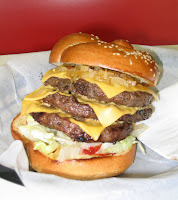 I had the Undisputed (pictured), which consists of three 1/3 lb patties stacked high on a homemade knot roll. In addition to the sheer size of this burger, the roll actually is a big factor in this burgers success. The roll is dense to help hold all the meat, and is ever so slightly sweet due to the egg wash on top. But hey, size doesn’t matter if it doesn’t taste good, right? Well, it tastes very good. Charred wonderfully, the burger is juicy inside and slightly crisp outside. Not big enough you say? How about a double Undisputed (6 patties) or even a triple (9 patties)? Think you can handle 3 lbs of beef? Gus doubts it, but will be more that willing to let you try. Overall “Wiener and Still Champion” offers excellent burgers in a less than attractive setting. While the menu is small and seating is limited, “Wiener” proves to be a true contender in the burger loving universe. Check out all my reviews (good and bad) by clicking here. Search by city and/or cuisine. And don’t forget to email suggestions of where you want me to visit next!